Growing sunflowers from seed is quite easy. The seeds are big and relatively quick to germinate. Sunflower plants look wonderful dotted among shrubs, at the back of an informal flower border, or at the center of an island bed. If you plant them in your vegetable garden, the best spot is at the north edge so these tall annuals don’t shade other plants. Cut sunflowers are expensive to buy, so if you have the space, it’s well worth the effort to grow your own. 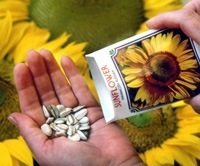 Because the seeds are big and easy to handle, growing sunflowers is a perfect project for gardening with children. You can give sunflowers a head start in peat pots, but you can direct seed them into the garden if you wish. If growing sunflowers from seed indoors ahead of time, use peat pots, which are ideal for plants like sunflowers that don’t like to be transplanted. Sow two seeds per pot, cover with plastic to keep moist; keep under grow lights, sunny windowsill, or greenhouse. Once seeds germinate (10 to 14 days), pinch out weakest plant, so you have one per pot. Give seedlings bright light; water and fertilize regularly. Plant young plants into garden, pot and all (the roots will grow through the peat) after all chance of frost is over. If you’re growing small cultivars in containers, transplant to their final pot. Alternatively, direct-sow seeds into garden about one foot apart after danger of frost has passed. When the plants get about six inches tall, thin to 2 to 4 feet apart to give individuals space to spread. Birds sometimes go after sunflower seeds in the ground, or get at emerging seedlings, so you may have to cover them with netting to protect them until they are about 4 inches tall.